Relax and unwind with a rejuvenating and revitalizing massage and spa treatment, allowing yourself the ultimate in pampering indulgence. This museum features the largest collection of rare and exotic butterflies and beetles in Australia: from the giant dragonfly of the Daintree rainforest to some of the world’s most beautiful insects. Be taken on a unique rainforest tour where your feet don’t touch the ground. Fly through the air on flying fox zip lines stopping at five tree platforms to get a bird’s eye view over the rainforest, and out to the Great Barrier reef. Allows you to experience the wonders of the Great Barrier reef with their highly trained team to ensure you a safe and memorable day, visiting Mackay and Undine reefs. Go on an exhilarating ride from the shores of the rainforest to snorkel the spectacular Great Barrier Reef in only 25mins. Only 5 minutes drive from The Prema Shanti Yoga and Meditation Retreat to beautiful white secluded beaches. Picture perfect white sandy beaches fringing the tropical rain forest. Just off shore you can snorkel and scuba dive among the coral reefs. The Cape Tribulation section of the Daintree is one of the most ancient and primitive rain forests in the world, dating back 135 million years. It is well worth taking a guided tour into the rainforest, so that you can fully appreciate what you are seeing. These rainforests were listed on the World Heritage List in 1988. Look out for the elusive Southern Cassowary. 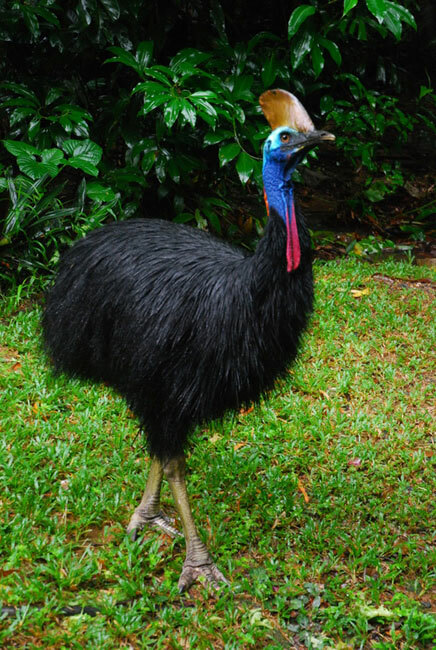 An endangered species, the Southern Cassowary grows to 2 meters tall and can weigh 85 kilograms. The Daintree Rainforest is a prime location for spotting these wonderful creatures. If you want to see the best of the Daintree Rainforest, come to Cooper Creek Wilderness – the sacred heart of the 135-million year old living museum. Explore the rainforest’s secrets with an experienced local expert. Tours provide exclusive experiences away from mass tourism and boardwalks. Only Cooper Creek Wilderness can guide you through World Heritage Rainforest on a natural trail. The #1 eco-tourism attraction in the Daintree Rainforest. Outstanding interpretive displays, interactive kiosks, a fantastic new Aerial Walkway, Canopy Tower, Cassowary Circuit, Bush Tucker Trail, DVD theatre, library, coffee shop. Take a self-guided audio tour through unspoiled, pristine rainforest in comfort and safety. Enjoy the 45 page Interpretive Guide book. Kayak around the magnificent Cape Tribulation headland, experience an eco friendly guided mangrove walk and sample tropical gourmet refreshments including fresh coconuts. No experience necessary; all equipment provided; free transfers from Cape Tribulation area with both morning and afternoon trips. Sea kayak hire also available. If you are interested in any of the local activities, click here and complete an enquiry form.